Coll. No. 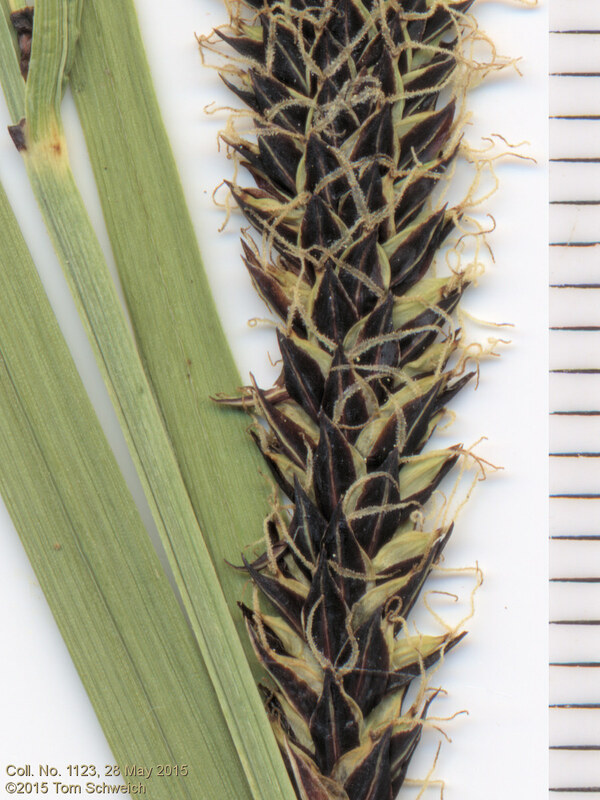 1123, 28 May 2015, characters observed: Perennial herb, to 50 cm., growing in running water; Inflorescence, 3-5 spikelets, 18-31 mm., cylindrical, lowest pistillate, peduncle 6 mm., stout, erect, intermediate pistillate below and staminate above, upper staminate; Bracts, lowest without sheath; Scales, pistillate, 3.5 mm. × 1.4 mm. wide, generally black except prominent midrib and chartaceous margin; Perigynia, 3.0 mm. × 1.2 mm. wide, some 3-5 veined, but not all, beak, 0.4 mm, bifid; Stigmas, 2.